Cold therapy is also known as ice therapy or cryotherapy, and should be used in most cases where there is an acute injury such as; Contusion: which is a bruise without a break in the skin usually caused by a hard blow to a muscle. Strain: which is a tear of a muscle due to overloading forces which can be caused by the sudden contraction when sneezing. Sprain: which is an injury to the ligament of a joint which is forced beyond it’s normal range of motion such as in a whiplash type neck injury. Using ice is often employed to reduce swelling from injured tissues. Inflammation is a natural response to injury to help repair tissue; however, too much inflammation causes pain. 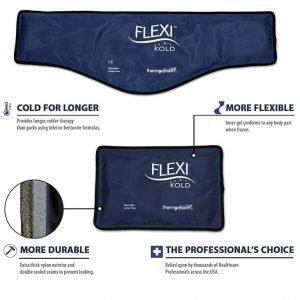 Cold applications can help minimize inflammation, reducing pain and speeding healing. When neck tissues are cooled, the local metabolism is decreased, blood vessels are constricted, and it reduces conduction of nerves. This helps to relieve pain. 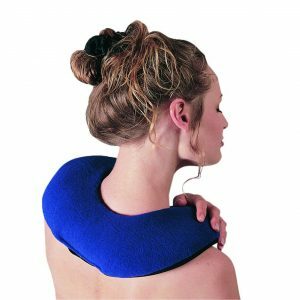 Ice can be applied in many ways; ice massage is a great method to get very specific areas of the neck and reduce the time it takes to produce the intended effects. 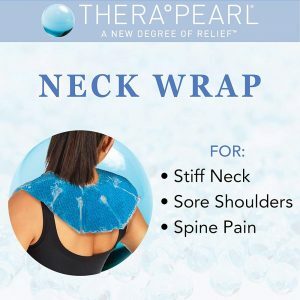 Using ice for neck pain relief is most easily used with special wraps that secure around the neck for hands free application. 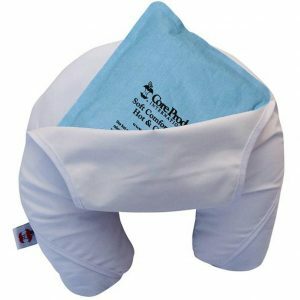 Using a warm, moist towel over an ice pack can take away some of the shock of something very cold, which can cause muscle spasm or tightening, and the initial warming sensation allows you to gradually adapt to the cold. This helps to avoid any initial sudden reaction to cold which can tense the muscles. We always have to be concerned about frostbite, so always pay attention. Another method of applying ice therapy is ice massage. Freeze water in a foam or paper cup and tear off the top and rub the ice directly on the neck. Do not hold the ice in any one spot for more than 3 minutes. A 2010 study in the Journal of Manipulative and Physiological Therapeutics indicated “The use of ice or cryotherapy in the management of sport injuries is widely accepted in clinical practice. A number of physiologic benefits of ice have been proposed including peripheral cooling of superficial tissues, a reduction of the inflammatory response, pain reduction, reduction of edema formation, and decrease in secondary hypoxic cell death. Ice massage is an effective and an inexpensive modality resulting in cooling of superficial and deep tissues in a relatively short application period when compared with other methods. Ice massage has been shown to be effective for reducing labor pain, decreasing pain and improving function in knee osteoarthritis patients, and reducing neuropathic pain.” The study from this article found that ice massage reduced pain and muscle spasm associated with exercise. Ice massage uses ice applied directly to the skin by using a circular or back and forth motion on the site to be treated. One method for larger areas like the back is to begin the massage about 12 inches from the exact site of injury, and then slowly move centrally toward the injured tissue, so the massage is concentrated in an area that is approximately 6 inches in diameter. This is a very effective method to apply ice. years ago, I would use a paper cup with frozen water, peeling the cup back to get the proper amount of ice. Keep a towel handy to absorb the melted ice as you go. This mainly comes from ice massage, but can apply to all forms of cold therapy. Coolness: The first sensation is that of coolness, which is felt almost immediately and progresses to an uncomfortable cold sensation into the next stage. Burning: The uncomfortable coolness turns into a burning=type of feeling. This usually lasts about 3 minutes. Aching: The aching sensation is of short duration, but it signals the approach of the final stage. Numbness: As the ice massage is continued, the area being treated becomes progressively numb (almost analgesic). When the reaction reaches this point or after 5 minutes (whichever comes first), the ice massage should be terminated. You should be familiar with the above stages using the ice. Care should be taken not to use this particular method for longer than 5 minutes. Do not hold the it motionless on one spot for more than 2 minutes. After treatment, the area should be dried with a cloth, but not rubbed. In general, when not directly applied directly to the skin, ice can be used for 20 to 30 minutes. After about 15 minutes, the packs are going to lose the effective level of cold. Place the ice packs or wraps in the freezer for about 45 minutes for it to again reach a therapeutic level for effective application. 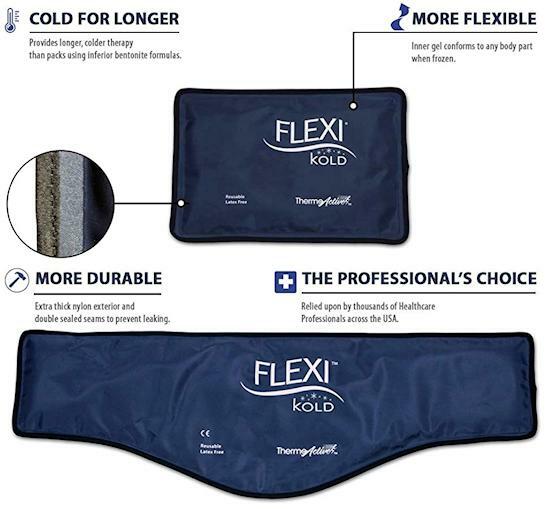 If the cold therapy packs are cooled for the first time, you should leave it in the freezer for about 6 hours before using. If the packs are going to be stored for a long time; defrost them, wipe them clean, dry thoroughly, and store in a freezer bag if possible. For maintenance, take out, clean and place in freezer about every 6 months to keep effective, and they should last for years. The new wraps allow easy application and storage. 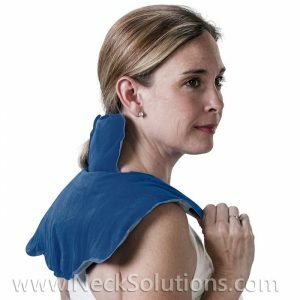 They can used sitting, standing or lying down, making them great for home use and very effective to apply to the neck, shoulders, and upper back. 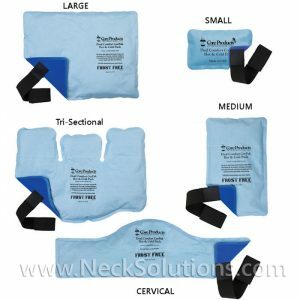 For an injury to the neck that has pain and inflammation, a good method is to use ice therapy 10 minutes every hour during the first 24 to 48 hours after injury, or 15 minutes each 2 to 4 hours. In order to use these methods, you have to have the packs ready to use. So, having one ahead of time requires some planning. 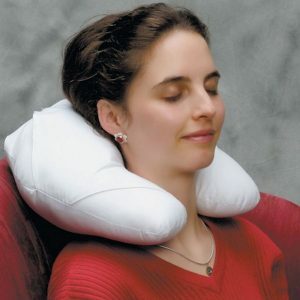 If you have neck issues, it is a good idea to have one around. However, injuries are often unexpected, so you may have to improvise. You can crush ice and put in a plastic bag or even use a bag of vegetable already frozen. Don’t forget to use a towel over it first; you can use a paper towel and even use some warm water on it, a few layers is good. 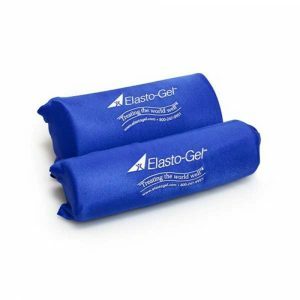 However, with conditions like arthritic disc degeneration or chronic disc problems, your neck is more susceptible flare-ups causing inflammation, so it is a good idea to have a plan ahead of time, and the cold therapy products for the neck are very good. 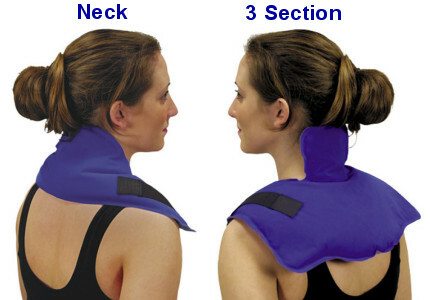 Many are quite versatile and can be used for heat therapy as well. Combining heat and ice is an effective method to reduce swelling. This can provide the benefits of ice therapy to those who do not like it. 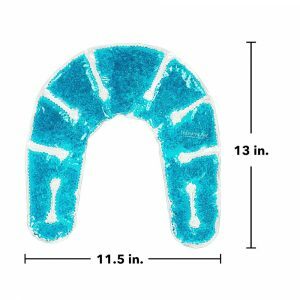 It allows use of heat without building up inflammation. Combination therapy also produces a pumping action in the tissues to prevent blood pooling. You should begin using heat, then alternate with ice. This can be done whenever necessary and is a great method to promote healing and rapidly progress from the acute to the sub-acute stage, where heat can be the main therapeutic choice. It is good for the best effect to allow consistency of heat and ice by using the same types of ice/heat packs. Cold is best used for recent or acute injuries or inflammation. However, there are times when a recent onset of pain does not require heat, like waking up in the morning with a stiff neck due to poor sleeping posture or sleeping under a cold draft. This usually responds best to heat – a hot morning shower. Because ice can cause an increase in tone of muscles, it is not used for relaxation, other than using them cold to cool down when it is hot. Generally, short periods of ice can help with neck pain relief by removing inflammation and may reduce muscle spasms that are directly related to the swelling and pain. Ice reduces pooling of fluids, decreasing the localized blood pressure and promotes lymphatic drainage. Although ice is well tolerated, some cannot tolerate this type of therapy. It may be hypersensitivity to cold, genetics or conditions like nerve numbness, arteriosclerosis or diabetes, where sensation is impaired. This can also include conditions like gout or rheumatoid arthritis or some collagen disorders. Always check with your health care provider if you are not sure.